The Marketing Keynote session was an enthralling session which covered various aspects of sales, service, marketing, communities, analytics, apps IoT in Salesforce new Commerce Cloud. Bryan Wade, SVP & Chief Product Officer, Marketing Cloud, Salesforce opened the Keynote. It started off with how to become a Customer Trailblazer. How Einstein has made 1-1 customer journeys in CRM smarter. 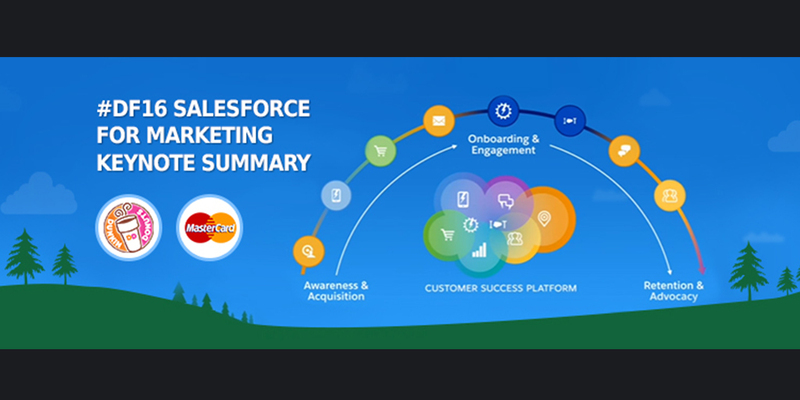 How the marketing cloud is more integrated with rest of the Salesforce than ever before. How Pardot and the marketing cloud can work together to drive leads in pipeline for driving business. Brian discussed the vision how Salesforce sees the customer lifecycle and 1-1 interactions across various touch points like Marketing Cloud, Sales Cloud, Pardot, App Cloud, Social Studio, Community Cloud, IoT Cloud, Service Cloud. B2C Market’s largest acquisition by Salesforce- Demandware: It created Commerce Cloud . Salesforce Commerce cloud empowers leading brands to engage with their customers . Unifies Commercial transactions and delivers rich and engaging experiences across all channels: web,mobile,social and store. It is B2B marketing automation system by Salesforce. Laser focused on building leads and pipeline for sales rep. Gives all the tools quickly to create campaigns that drive leads to sales. App Cloud – When one builds an app on app cloud Heroku, it can be connected to customer success platform. Social studio – Its value has been unlocked. It has been integrated into service with social customer care, integrated into sales with social selling, integrated into marketing cloud for 1-1 journeys. Service Cloud – With new marketing cloud integration into service cloud one has an opportunity to make every service interaction into a marketing interaction. User experience of journey builder is now aligned with rest of the Salesforce lightning design platform. Integrated Data sync- One can take standard or custom objects and map that data into the marketing cloud and that data can be synced. Customers are syncing over 3 billion Salesforce contacts and using it for Personalizing, Audience building etc. Inputs like email, clicks, conversion, negative inputs, can be scored for customers. Personalization can be powered on the website with predictive recommendation. Einstein provides image recognition technology that identifies picture of one’s product, if it has been posted on social media like twitter without having hashtags or @ associated with it. Helps gain more insights into what is happening with the customers on social media. Salesforce has announced its intent to acquire Krux, the leading Data Management Platform. AI helps take billions of inputs from devices in the web and to find new prospects, unifies data, captures it, builds audience and targets these audiences with 1-1 advertising on every channel and device. Instructions could be sent from Krux Cloud to the Salesforce Cloud using Salesforce Active Audiences API’s. Demo was presented keeping three companies in mind- Master Card, change.org, Dunkin Donuts. Mastercard demo- It focused on marketing cloud, Pardot and analytics cloud and how these clouds came together to help Mastercard in the awareness and acquisition phase of their lifecycle journey for their B2B selling teams. Marketing Cloud- Helps drive 1-1 customer journey for new users Onboarding. Service Cloud- With new marketing lightning cloud integration one can sync all that data for personalization, audience building, trigger off 1-1 customer journey when the case closes. Community Cloud –It runs on all devices and provides platforms for conversation with Customers and employees and it integrates with the Service Cloud. Uses marketing, commerce, community service and apps cloud from Salesforce. They have a rewards program DD Perks that helps drive retention and creates advocacy. Use highly targeted advertising to drive awareness about new locations and new products. Massive use of email, social media and journey builder helps drive customer engagement and onboarding. Have 7 different apps built with app cloud with clicks and minimal code. Apps for event planning, merchant management, relation management with franchisees etc.